If you want the very best, then you will want to be sure to buy this 60 x 60 Ultimate Party Tent manufactured by Ohenry Tents. For hosting large events such as reunions, weddings or outdoor revivals, you will not find another tent that offers better durability or a more attractive appearance than these 60x60 canopies. Unlike many other large tents, this Premier tent comes with an instructional video to help you set up your tent with the greatest efficiency, guy ropes to help with securing the tent top in place as well as a patch kit should anything happen to the 60' by 60' tent itself. 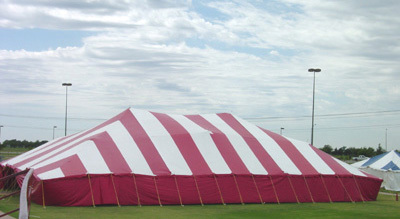 To get the most for your money, this Ultimate Party Tent is your best option. How much does this pole tent weigh when in storage? The total weight is 1,680 pounds.